Much awaited 2nd episode of the GUEST POST by my aunty Dr. Bindu. Read the 1st one here. Soon several chitals (antlered spotted deer) run across the road fleeing as though there is no tomorrow, and indeed for one of them this might be the case! We know now that the tigress is on the prowl. There is no sound. Everything is still. Then she comes leisurely strolling through the woods. Majestic and measured in her stride she rather good-naturedly walks along right in front of our stationary jeeps and crosses the road unmindful of us. This is the walk of someone who has never known anything other than that she is the queen of the jungle. We are spellbound. No photograph can do her justice. Her black stripes stand out against the golden-yellow fur. Unhurriedly, to our great delight, she walks further into the woods looking straight ahead till she merges into the forest. This is my first ever “darshan” of this magnificent animal in her own kingdom. Many thanks to all the stray cats in Mumbai for conveying my repeated and often imperious requests for a darshan to their regal cousin! On our last safari ride, the morning of the 17th we could not spot a tiger though we heard several sambar calls, drove back and forth and waited a few times for a tigress which had been sighted by another jeep. A little disappointed we head for breakfast in a clearing in the park before leaving this heavenly forest. As we are about to park a guide from another jeep tells us to drive to a nearby lake where “there has been some activity”. When we drive towards the lake some jeeps are already parked on the road. All is quiet. A little girl signals me to “hush!”. 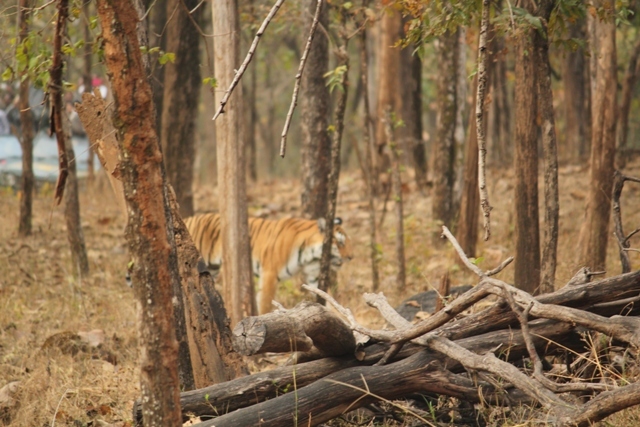 A tiger cub, at least a yard long, is walking in the bush. He later crosses the road with a slow graceful gait. We watch entranced. The tigress and her cubs were making their way to the water. Ramesh and our forest guide Rohan take us closer to the lake. Though we are at a distance we are thrilled to see the tigress bringing her three cubs to the water. We feast our eyes on the cubs playing with their mother, lying on a rock and then walk into the thicket. Our spirits soar. 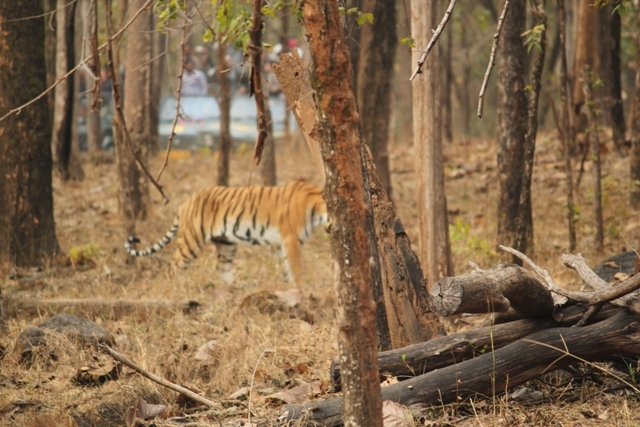 We are so very grateful for this second spotting but nothing can compare to the tension and drama that accompanied the first tiger darshan. I enjoyed your blog just as much as I enjoyed the video.Your narrative made a lovely picture of the forest for me….Someday I should go there…. Will check it out with you as to how to get it organized. Thank you so much for this Tiger Darshan. My little grand-daughter Zoe-Smita who arrives yesterday watched it with me and was just as thrilled. This is fantastic. YOU are lucky as you know well. Absolutely spectacular! What a magnificent sight! What a majestic cat! It must’ve been brilliant watching live. Beautiful creature! So lucky you got to see one which made it worth the visit. Was Jyoti happy she saw the tiger? She was!!! We ALL were spell bound and very happy!!! How fantastic! Those are wondeful images! I will share them with the kids tonight! Thanks for sending! How did the kids react? ?